Wash potols and cut then into thin slices. Wash, peel and cut potatoes into medium sized slices. Take a microwave safe bowl and add potato pieces and potols pieces. Add 25ml water to the vegetables and place the bowl in microwave oven. Cover the bowl partially and cook on high power for 6 to 7 minutes. Stir once and again place the bowl in oven and cover it partially. Cook the vegetables 0n 30% power for 7 minutes. Allow 3 minutes standing time before removing the bowl from oven. Wash and chop the curry leaves. Heat a pan and add oil to it. When oil is hot add black gram and fry till the seeds start changing color. Then add mustard seeds and cumin seeds. Fry the seasoning till all the seeds are fried well. Then add curry leaves and mix. Add turmeric powder and mix. Add the cooked vegetables and mix well. Add required amount of salt, red chili powder and vepudu karam. Mix all well and cook covered on low flame for 3 to 5 minutes. Remove the lid and mix the curry well. Transfer the curry to a serving bowl and serve hot with rice or roti. If the curry leaves are big chop them finely. Cooking time in a microwave oven may vary a bit depending upon the capacity and wattage of the ovens. Do not remove the water after cooking the vegetables in oven. Add the vegetables to the seasoning along with remaining water and cook. After adding turmeric powder to the seasoning, quickly mix it and add the vegetables. Over frying the turmeric powder in oil burns it. At the same time, adding it to the seasoning helps in getting mixed with the oil which in turn gets mixed well with the vegetables to give a nice color. 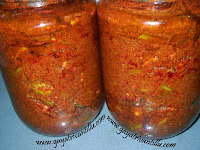 Salt, red chili powder and vepudukaram, use as per your taste. 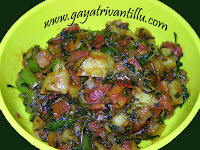 Hello Gayathri garu ..... mi vantalu chalu baguntai .... i tried many of your recipes ... they came out very tasty and also recomend your website to many of my friends ..... looking forward for many more recipes . 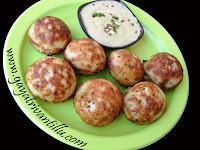 Nenu chala regular ga mee blog visit chestanu.Meeru cheppina chala recipes try chesanu anni chala tasty ga vachae. Mamanchi tips tho patu easy ga cheyatam elago kuda cheputtunnaru. ur vantillu is superb,i love the way u give a detailed discribtion for each and every minor thing.